2016 Summer Camp Registration is opening for Sunny Isles Beach Residents Saturday, April 2 at 8:30 am at Pelican Community Park, 18115 North Bay Road. Bring a SIB Resident ID Card and sign up the children for one of several General Day Camps, Sports Camps or Specialty Camps offered weekly, June 13 through August 19. Do not miss Summer Camp Registration opening for Sunny Isles Beach Residents this Saturday, April 2 at 8:30 am at Pelican Community Park (18115 North Bay Road). Bring a SIB Resident ID Card, and sign up the children for one of the several General Day Camps, Sports Camps or Specialty Camps offered weekly, June 13 through August 19. The City offers Summer Camps for children ages 3-15 (10th Grade), including Camp Tot Lot (a half-day preschool program), General Day Camps, divided in to four age groups, Musical Theater, Fine Art, Lego Robotics, Basketball, Cheer & Dance, Flag Football, Soccer, Volleyball, Wacky Sports Week & much more. 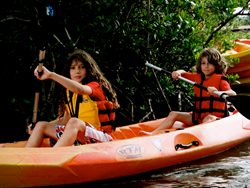 General Day Camp activities include games, crafts, water days and special hands-on programs featuring painting and cooking (which come to Pelican Park). General Day camps take trips to the beach, fun water parks, bowling, laser tag, museums and the movies. Sports camps teach or refine the skills required for proficient play in a fun and safe environment. Specialty Camps concentrate on a particular interest for the week, aiming for specific goals, but also making sure to incorporate fun in the process. Registration is accepted on a first-come, first-served basis. To hold a spot, stop by Pelican Community Park with completed forms and pay the fees. For more detailed information on all of these camps, please download our 2016 Summer Camp Brochure at sibfl.net/dept_cultural/summer_camp. Registration for Non-Residents begins Saturday, April 16. For information about camps and other cultural programs and events go to the official City website at sibfl.net, watch SIBTV, or follow the City on Twitter & Instagram (@CityofSIB), or on Facebook (City of Sunny Isles Beach). For questions, please contact Cultural and Community Services at 305.792.1706.